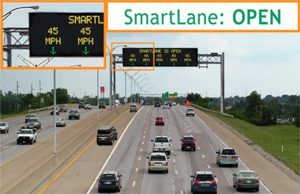 Ohio is currently building a SmartLane on one of its’ busy interstates, Interstate 670.This SmartLane is actually just the left shoulder o f the highway that can be opened in an attempt to reduce traffic congestion during heavy traffic times. There will be live video footage that records the situation on the interstate and radar detectors that collect traffic speeds. If traffic is driving below 45 miles per hour, a representative at the Ohio Department of Transportation Traffic Management Center can make the decision to open the lane from his/her office. The SmartLane can also be used if there is an accident that is blocking other lanes. There are many other factors collected in the decision of whether to open the SmartLane or not. Some of these factors include weather, debris, road conditions, and accidents. The digital screen (pictured above) will include information about the status of the SmartLane, the speed limit, and any other traffic updates. The SmartLane is expected to be complete in October 2019. The SmartLane is a perfect application of how technology is making our lives more efficient by relieving something many people hate, traffic congestion. This is an expensive project as it is expected to cost $61 million, but it will result in many less gallons of gas and many less hours of time spent in traffic on the interstate for the drivers. 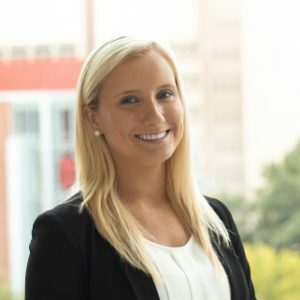 I think it’s interesting that Ohio is taking this initiative when the focus of technology and traffic lately has only been on driverless cars. I think this will be very successful for the Ohio Interstate 670. How can technology be used to relieve some of the traffic congestion in Center City Philadelphia?